• The fir tree branch design on all four sides makes a 360-degree interface with the panel, creating a more secure fit into the hole. • The disc on the top of the fir tree covers the hole and minimizes the ingress of water and dirt. • The oval hole fir tree fits 4 common automotive oval hole sizes. • The specific connector slot on this part reduces rattle and movement of clip to the wire harness connector. • The fir tree branch design on all four sides makes a 360-degree interface with the panel, creating a more secure fit into the hole. • The disc on the top of the fir tree covers the hole and minimizes the ingress of water and dirt. • The oval hole fir tree fits 4 common automotive oval hole sizes. 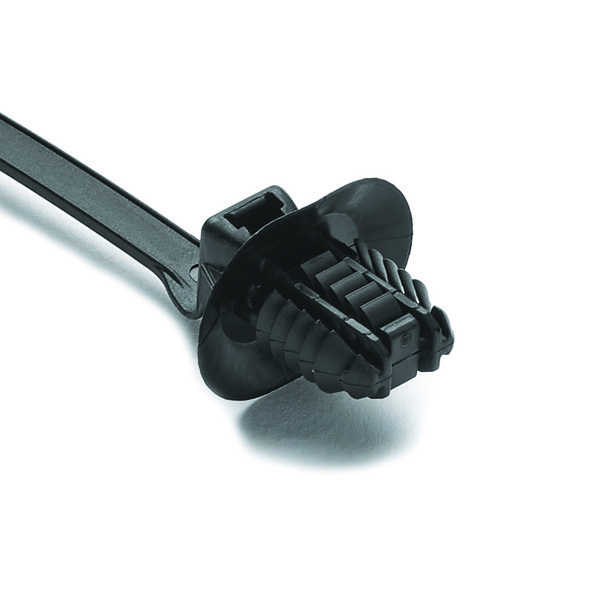 • The specific connector slot on this part reduces rattle and movement of clip to the wire harness connector. The one-piece cable tie and fixing offers a simple and easy to use method of bundling and fixing cables. The innovative design of the fir tree creates an interface with four different size holes that are common in the automotive industry. The fir tree branch design on all four sides makes a 360-degree interface with the panel, creating a more secure fit into the hole. The 'disc' on the top of the fir tree covers the hole and minimizes the ingress of water and dirt. These cable ties feature a fir tree mount that has an innovative four sided 360° branch design that offers full interfreence for a wide range of oval hole application. This industry-first design allows for one part to be used across multiple hole diameters, and delivers cost savings through part consolidation. The clamp rails along the inside of the cable tie strap increase the grip around bundles, lowering the potential for lateral cable bundle movement.